After a one-year hiatus, Heavy Montreal will return to the festival's titular city this summer as promised, and the list of hard-rocking performers has just been announced. Avenged Sevenfold, Rob Zombie and Marilyn Manson top the bill. The rest of the lineup is rounded out by acts like Gojira, Emperor, Underoath, Hollywood Undead, Trivium, Sleep, Asking Alexandria, Alestorm, Ratt, I Prevail, Baroness, Voivod, Between the Buried and Me, Nile, Witchcraft, Red Fang, Tech N9ne, Napalm Death, Black Dahlia Murder, Eyehategod, Igorrr, Glory Hammer, Helix, Perturbator, Necrotic Mutation, Power Trip, Blind Witness, the Agonist, Havok, Ultra Vomit, Bad Omens, Intervals, Jinjer, Get the Shot, Khemmis, Nonhuman Era and more. The festival will take place over the course of July 28 and 29 at Parc Jean-Drapeau in Montreal. On July 27, there will also be the Heavy in the City event. Tickets for the festival go on sale this Saturday (February 24) at noon local time. 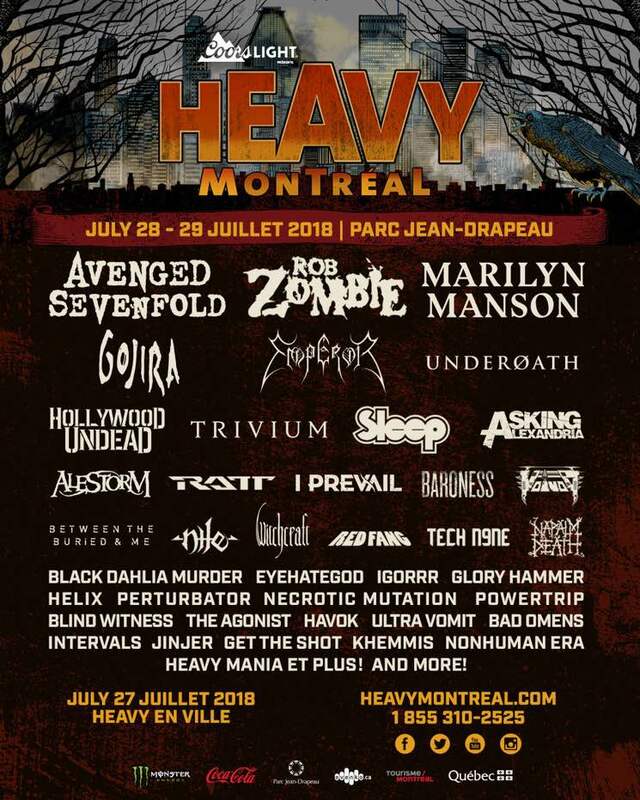 For full festival details and updates, check out the official Heavy Montreal website. To learn more about the festival's history, check out Exclaim! 's Heavy Montreal festival profile. Marilyn Manson Forces Fan to Take Off Avenged Sevenfold Shirt: "That's Not My Band"
Avenged Sevenfold Add Canadian Dates to "The Stage World Tour"